HAMILTON HEIGHTS —Mismanaged co-ops in Hamilton Heights, Harlem, and East Harlem owe the city more than $21.2 million in unpaid taxes and water and sewage bills, according to data obtained by DNAinfo. Most of the co-ops started as foreclosed properties owned by absentee landlords that the city sold to tenants to give low-income New Yorkers homeownership. About 60 percent — 200 of 329 co-ops in Community Boards 9, 10 and 11— owe the city money, according to records from the city’s Department of Housing Preservation and Development. Of those, 49 owe more than $100,000, according to data obtained by DNAinfo. 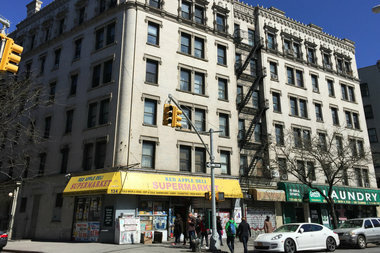 The worst offender — a co-op at 501 W. 143rd St. — is carrying a $3 million debt and is at risk of being foreclosed, according to HPD. If placed on the program, every member of the co-op would lose ownership of their apartment and be forced to become renters. For Ronaldo Kiel, who has spent more than $200,000 to buy and renovate his apartment, that would mean a complete loss on his investment. HARLEM — Savona Bailey-McClain got the idea for the West Harlem Food and Beverage Association while working on Community Board 9’s economic development committee as the group sought to bring a ferry operator to West Harlem Piers Park on West 125th Street. Potential operators kept asking the same question: “Where are the restaurants?” said Bailey-McClain, who is also the executive director of The West Harlem Art Fund, Inc.
“I started the association to show that we do have restaurants,” she said. The association covers neighborhoods from Edgecombe to the Hudson River from West 110th to West 155th streets. It includes Morningside Heights, Manhattanville and Hamilton Heights. There have always been bars and restaurants in the neighborhood but over the past couple of years West Harlem has developed even more establishments— and in unexpected places. HARLEM — If there was a dish that best described what acclaimed Harlem restaurateur Calvin Copeland tried to accomplish with his soul food restaurant Copeland’s, it was the chitterlings served with a glass of champagne, according to his son. The elder Copeland died Aug. 23 from Alzheimer’s disease at St. Luke’s Hospital — four years after closing his restaurant at Broadway Street between Broadway and Amsterdam Avenue due to a dwindling clientele and financial difficulties. His death comes weeks after that of another Harlem soul food folk hero, Sylvia Woods, who as the owner of Sylvia’s Restaurant, was known as the “Queen of Soul Food.” Woods, 86, died July 19 at her Westchester home after battling Alzheimer’s. “There were only two people always mentioned when it came to soul food in Harlem and it was Copeland’s and Sylvia’s,” said Michele March, who helped Calvin Copeland shutter his restaurant in 2007. “The rivalry people said was there was false. When Sylvia’s started getting bus tours and so many people she couldn’t feed them she would call and say: ‘Copeland, can you take 20 to 30 people?’ and he would say ‘Send them on up,'” said March. “That was the spirit they had. I loved them both and the Harlem community-at-large loved them both the same,” said March. But while Sylvia’s was located in rapidly gentrifying Central Harlem at Lenox Avenue between 126th and 127th streets, Copeland’s was in Hamilton Heights which grew with Latino immigrants. Prior to its closing, Copeland’s served food so good it drew a bevy of celebrities along with tourists and neighborhood residents, his son said. The menu included chitterlings, or pig intestines, baked macaroni and cheese, potato salad and collard greens along with desserts like bread pudding. Comedian Richard Pryor was once mobbed at the restaurant, Michael Jackson waited in a limousine outside while his food was delivered to him and Natalie Cole often had pans of bread pudding shipped to her in California. “God bless Luther Vandross, but my father might be responsible for his early demise. He ate here a lot,” said Vincent Copeland. Rep. Charles Rangel, who has represented Harlem for over 40 years, recalled Copeland as “truly a pioneer not only in our community but also an inspiration to the rest of the country,” he said. “I still remember when he opened Copeland’s Restaurant in 1967. For decades it brought people together, from both far and near, for some real good soul food,” he added. But his father was reluctant to close the restaurant because he saw it as a vehicle to helping the community partly because of his own past, said Vincent Copeland. Calvin Copeland was born in Virginia and began working in restaurants as a child. After his parents died he was sent North to live with an aunt who took him in and taught him her fried chicken recipe. It was while working at a restaurant in Paramus in the 1940s that he met his wife Rita, an Irish immigrant. They kept their relationship a secret at first because interracial relationships were still considered taboo at the time. After working in restaurants in New Jersey and New York City, Copeland opened his own storefront catering operation in Harlem at Broadway and 148th Street in 1958. Vincent Copeland said his father wanted the endeavor to be a family business where extended members of the family could work and invest. It was his way of thanking the family for taking him and his siblings in after his parents died. Soon he was selling soul food and custom cakes and also opened a cafeteria style restaurant before expanding and taking over another storefront where he started Copeland’s. Vincent Copeland said his father, whom he says struggled with alcoholism for many years before becoming sober, saw the restaurant as a way to give people second chances. “There was an endless succession of recovering drug addicts, alcoholics and men just released from prison, some of whom had never had a job before,” said Vincent Copeland. Calvin Copeland gave one homeless man a job as a pot washer and night security man. Another man, a drug addict who refused offers of jobs inside the restaurant, became a car washer and watched for the police as double parked customers ducked into the restaurant. That’s why Calvin Copeland always thought he would reopen the business one day, said Gertrude Clark, who was one of Copeland’s first employees. She made the potato salad the restaurant was famous for and other soul food delicacies despite not having a background in southern cuisine. Calvin Copeland handled every aspect of the business from cooking to cleaning while his wife Rita handled the books. A long-time customer, Charlene Singleton, said she was surprised to learn that the man in the white chef’s hat was the owner. She requested the manager after one of the workers wouldn’t fill her request for white meat chicken one day. Calvin Copeland was preceded in death by his wife Rita. He is survived by his four children, Vincent, Irene Clark, Calvin Copeland, Jr. and Gwendolyn Copeland. Funeral services will be held at 10 a.m. Wednesday at Our Lady of Lourdes RCC, 436 West 142nd Street. The plan would safeguard an architectural treasure trove by imposing height limits in the neighborhood for the first time ever, radically transforming the zoning of a 90-block area. If the sweeping proposal from the Department of City Planning is approved, it will mark the first time the neighborhood’s zoning has been updated since 1961 — when Robert Wagner was mayor and Nelson Rockefeller was governor. The so-called downzoning will preserve roughly 95% of the 1,900 lots bounded by W. 126th St. on the south; W. 155th St. to the north; Riverside Drive on the west, and Convent and Edgecombe Aves. to the east. That includes Sugar Hill, the affluent historic district named for the sweet life enjoyed by its residents, and Hamilton Heights, traditional home to such African-American luminaries as composer Duke Ellington, Supreme Court Justice Thurgood Marshall and civil rights activist W.E.B. DuBois. “This is huge!” says Manhattan Borough President and mayoral hopeful Scott Stringer. The rezoning will protect West Harlem’s low-lying scale and “guide future development” to mesh with the area’s prewar apartment houses and Beaux Arts, Queen Anne and Romanesque Revival brownstones, says City Planning Commissioner Amanda Burden. Heights would be capped at four to six stories on almost all crosstown, residential mid-blocks. They could rise only to six to eight floors on St. Nicholas and Amsterdam Aves. and up to 12 stories on Broadway, a review of the plan shows. The impetus for the downzoning: Columbia University’s upzoning of an adjacent, 17-acre parcel in Manhattanville, where it will erect a $6 billion, 16-building super-campus, north of 125th St. and west of Broadway, over the next 25 years. Stringer and City Councilman Robert Jackson, who represents the area, had pressed City Planning officials to rezone the adjoining swath so West Harlem could co-exist with Columbia — and not be dominated by it. “Columbia is humongous, its endowment is in the billions, and people have a real fear that housing costs will go up and they’ll no longer be able to afford their homes because the new campus will fuel gentrification,” Jackson says. Under the city’s land-use review procedure, Community Board 9, as of May 7, had 60 days to review the proposal, after which it goes to Stringer, who has a month to review it and suggest changes. Then it goes to the City Planning Commission, for a 60-day review, and finally, to the City Council, which has 50 days to approve, modify or reject the zoning proposal. Insiders predict it will take effect after some minor tinkering. Public reviews generally last a maximum of seven months — and that’s a good thing, says state Sen. William Perkins, who represents the area. “There are preservationists in my district who would chain themselves to those brownstones to protect them,” he says. * Allow commercial uses in a light-manufacturing district between W. 126th St. and W. 130th St. to spur job creation. The so-called mixed-use zone could attract retail and arts companies or other non-profits. * Direct future larger-scale development to a single block on W. 145th St. between Broadway and Amsterdam Ave. Only on this one site could a residential building rise to 17 stories, and only if it included a significant amount of affordable housing. * Steer community facilities — like a gym, a library or a halfway house — to commercial and manufacturing corridors by reducing the amount of floor area they’re permitted in residential areas. HARLEM — During the day Montefiore Park, located next to the 137th Street subway stop on Broadway, is mostly used a corridor for City College students heading to campus. At night, the park and dimly lit side street becomes a stomping grounds for the homeless, marijuana smokers, beer-drinkers and their waste. 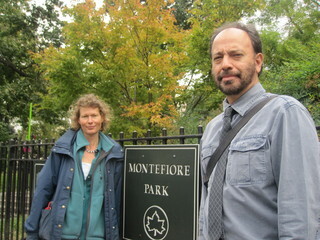 “The smell of urination is so powerful that it is not serving the community as a park, a place of peaceable enjoyment for people that want to enjoy nature,” said Barbara Nikonorow, one of the leaders of the Montefiore Park Neighborhood Association. All of the grass is surrounded by gates and senior citizens bring their own chairs to the park. But the Hamilton Heights park wasn’t always an afterthought. The park was created in 1906 and named after Sir Moses Haim Montefiore, a wealthy Italian-Jewish businessman turned Jewish advocate. Before the city removed all the benches and put gates around the grass to deter drug activity, old-timers remember people playing dominoes at the park and parents with kids in tow chatting there. “It was an important part of daily life before the whole neighborhood went into a state of disrepair and depression with the onslaught of the crack epidemic,” said Micheal Palma, a co-leader of the Montefiore Park Neighborhood Association, which his mother founded. “Now, it’s like a zoo for grass. You can look at the grass from behind the gates but you can’t use or touch it,” he said. But in 2008, the park, bounded by Broadway and Hamilton Place from West 136th to West 138th Streets, was placed in the Department of Transportation’s Plaza Program and designated for a redesign. By closing Hamilton Place from 136th to 138th streets, the size of the park will be doubled. The $6.4 million project is scheduled to begin construction in 2014 and be completed in 2015. In advance of the changes, the Montefiore Park Neighborhood Association is hosting a series of visioning workshops. Starting Saturday, they will host events where Hamilton Place is closed to give the public a sense of the change to come. A monthly cleanup session will be combined with turning Hamilton Place into a play street. A farmer’s market launched at the park in July and runs every Tuesday through to November. Palma said the group is being proactive in an effort to make sure their wishes for redesigning the park are incorporated. Heritage Health and Housing, the Harlem Community Development Corporation and City College’s Architectural Center are also partners in the effort. “What we are trying to do is do is demonstrate to the DOT and Parks Department that this is a big deal to the community. We have definititive ideas. We don’t want to see speckled sand and some tables and then say: ‘We are finished.’ We want to totally redesign the park,” Palma said. At a meeting Wednesday, area residents and business owners endorsed the idea of closing the two block stretch of Hamilton Place twice per week, said Thomas Lunke, director of planning and development for the Harlem Community Development Corporation. Residents said they want to see festivals return to the park, along with street games such as dominoes and chess tables. They also want the park to be used for fitness, and also for food vendors and vegetable sellers to occupy the expanded space. Palma also said they wanted more social services directed to help some of the homeless and drug-using population that currently occupies the area. “We want to make it more of a community living room rather than a passageway for students going to City College. We want it to be a place where the community can engage one another,” said Lunke. Other benefits would include a smoother traffic pattern along Broadway and Hamilton Place, which is closed off after 138th Street because the rest of the short street is one-way running south. The park has the potential to be an economic draw for the area, said Nikonorow. It is close to a transportion hub and young families are moving to the neighborhood. The senior population and City College and public school students are natural park users. “It’s strange that no one thought until recently that the best way to keep this park from drug dealers is to make it a really useful place,” said Palma. HARLEM — After several weeks of working on the second largest mural in the history of the Creative Arts Workshop for Kids, a group of teenage artists unveiled their massive work, “Magic With Logic,” at P.S. 192 on Wednesday. It is an effort to display some of the history and daily life in Hamilton Heights while also inspiring others, they said. The birds represent freedom and striving on the multi-colored mural on 138th Street between Hamilton Place and Amsterdam Avenue. The elephants are the elders of the community who pass knowledge to the young people flipping, dancing and playing soccer nearby. And a sun is composed of people’s hands reaching out to the community and their own future. The bright yellows and reds of the mural along with its rabbits and birds nod to the fact that Barnum & Bailey circus used to call the area home. Men play dominoes in the artwork, just as they do blocks from the site. Even the local shaved iced vendor on the corner is depicted. The students drew inspiration from Harlem Renaissance painter Aaron Douglas and the poetry of poet William Braitwithe, a Sugar Hill resident. “It just opened the doors of their imagination. Just seeing them get over their fears was amazing,” said poet J. Ivy, who has worked with Jay-Z, Kanye West and John Legend and partnered with the kids on a spoken word project that goes with the mural. Visitors to the artwork will soon be able to scan a code with their smart phones to get a guided tour from the artists and hear some of their poetry and spoken word, said Brian Ricklin, executive director and CEO of Creative Arts Workshop for Kids. Molaundo Jones, program director for Creative Arts Workshops for Kids, said the mural was about much more than art. “This gives them a sense of how they can impact their community. When they were working on this and saw the way people have responded, it had more meaning,” said Jones. The artists said they learned to work together. “We were all a little shy because we felt we weren’t artists. We didn’t have the confidence,” said Tiguida Toure, 15. But that changed as the mural came together. “We became more than friends, we became a family,” said Richard Rosado, 19. The community also chipped in. From the superintendent of the building across the street who helped put up the ladder everyday to the shaved ice guy on the corner who provided refreshment during blazing summer days, the community embraced the project, participants said. In addition to the artistic experience, the kids involved with the mural — sponsored by advertising firm SelectNY — were also able to earn a paycheck. Herwig Preis, SelectNY’s president and CEO, said he hopes to commercialize the mural into t-shirts or other items. He also offered each of the mural participants two week internships at his firm starting in the fall. “Whatever you can dream of you can achieve,” Preis told the students. Rep. Charles Rangel said the artists have made a long-lasting impact on their community. “I can hear you bragging now to our kids, saying look what I did when I was young. I don’t blame you because it’s a gorgeous piece of art,” said Rangel. Normensinu said the mural is something he’s going to remember for the rest of his life. “It represents us, the people and culture of Harlem, and it’s going to live forever,” he said. The New York Times yesterday profiled Hamilton Heights, the neighborhood just north of West Harlem. Extending on the west side roughly from 133rd to 155th streets, Hamilton Heights boasts the picturesque campus of the City College of New York, a housing market that’s a lot cheaper than its downtown counterparts, and zero Starbucks stores. The impact of Columbia’s Manhattanville campus on West Harlem has been much scrutinized. West Harlem residents have been vocal in both their support and criticism of the University’s expansion, but not as much attention has been paid to the other neighborhood, Hamilton Heights. Tom Smith, a professional clown who has lived in a three-bedroom co-op on Riverside Drive in Hamilton Heights for seven years, is torn about the new campus. He said he did not like the institution’s use of eminent domain to get its hands on some key parcels. “I’m not really an eminent-domain kind of guy,” he said. Yet he thinks Columbia will help curb street crime, which in turn may make the area a more pleasant place to walk. “There will be a lot less chicanery and hustling going around,” he said. Upper Manhattan’s Hamilton Heights derives its name from its most famous early inhabitant, Alexander Hamilton, who bought land in the area in 1799. At that time most of Upper Manhattan was still rural, and it wasn’t till the 1880s that the neighborhood’s stately townhomes began to be built for well-to-do white residents. By 1919, the northern section of Hamilton Heights was beginning to be referred to as Sugar Hill, where “life is sweet.” The area rose to fame during the 1930s when a wave of black professionals moved in. Supreme Court Justice Thurgood Marshall, the novelist Ralph Ellison and jazz legends such as Charlie Parker all called the neighborhood home around this time. The neighborhood, which lies in the western portion of Harlem just south of Washington Heights, hit rough patches in the decades following. During the 1980s, many residents fled as crime surged in surrounding parts of Harlem. “Nobody wanted to live here,” said Willie Kathryn Suggs, a broker who has lived in Hamilton Heights since 1985. Crime in the area never reached the levels seen in other parts of Harlem, Ms. Suggs said, but it did make property cheap. She bought her office in the neighborhood at the time for about $50,000, she said. Now the townhomes of Hamilton Heights, many of which are in a landmarked historical district, are the properties that are in most demand, Ms. Suggs said. Of the 84 residences currently listed for sale on real-estate site StreetEasy.com, the median asking price is $537,000. The median price a square foot is $458. 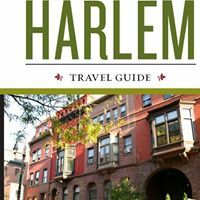 In Central Harlem, it is $571 a square foot, and in neighboring Washington Heights, it is $427, according to StreetEasy. The area has several large parks. On West 147th Street, there is a four-story townhouse built in 1901 that was renovated five years ago. The stoop was rebuilt, the antique doors and railings were restored and new windows were installed. The rust-colored townhome, with four bedrooms and three bathrooms, measures 3,200 square feet, is currently on the market for $2 million. On Convent Avenue there is a two-family townhouse on the market for $1.21 million, listed by Ms. Suggs. It’s one of a row of 10 limestone townhomes built around the turn of the century. It has five original fireplaces, original window and door moldings and a private garden. There are six bedrooms and five bathrooms in the four-story home. Unlike other areas of Harlem, there wasn’t much available land for new development in recent years. But a handful of new condo buildings have been constructed. On West 136th Street, Gold Development built a six-floor, 29-unit condo building in 2006. That sold out in four months, said Romy Goldman, founder and president of Gold Development. On Edgecombe Avenue, Gold Development built a 12-unit, six-floor condo building in 2009 called Hamilton Lofts. Each unit has its own floor with elevators that open up directly in each condo. There is one unit left there listed at $624,000. One of the neighborhood’s drawbacks is a lack of retail outlets. There are several banks and pharmacies in the area, but for many other types of retail needs, residents have to travel down to 125th Street. Sit-down restaurants are also far and few between. Schools: Hamilton Heights’ public schools are in District 6. They include A. Philip Randolph Campus High School, Hamilton Heights School and New Heights Academy Charter School. Other schools in the district include P.S. 325 and Twenty-First Century Academy for Community Leadership. In 2010, 43% of District 6 students in grades three through eight received a proficient score on the math exam, and 29.4% of students received a proficient score on the English Language Arts exam. In 2006, the results were 44.8% for math and 37.8% for reading. Private schools in the neighborhood include Our Lady of Lourdes School, which runs from nursery school through eight grade, and Dorothy Day Early Childhood Center. 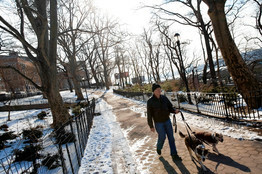 Parks: St. Nicholas Park, measuring about 23 acres, is one of three large parks in Hamilton Heights or adjacent to it. 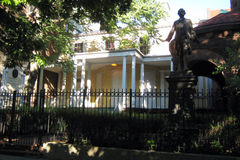 A portion of the St. Nicholas Park was the site of where George Washington fought during the battle of Harlem Heights in 1776. 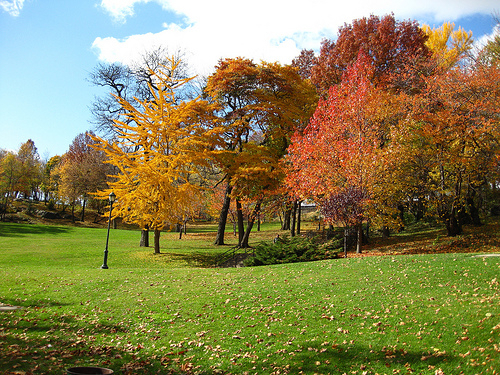 The park was later designed by landscape architect Samuel Parsons Jr. and was constructed in 1906. Now it has areas for barbecuing, basketball and handball courts, playgrounds and dog runs. On the banks of the Hudson River is Riverbank State Park, which has indoor and outdoor facilities spread over 28 acres. It has an ice rink, gymnasium, tennis courts and an Olympic-size pool. There are also basketball courts, a softball field and a football and soccer field. Nearby is Jackie Robinson Park, which was originally called Colonial Park and was renamed for the Brooklyn Dodger legend in 1978. The park, which measures about 13 acres, has baseball fields, basketball courts, playgrounds, and pools. Entertainment: Hamilton Heights is home to Harlem Stage at City College. The arts organization features music, dance theater and cinema. 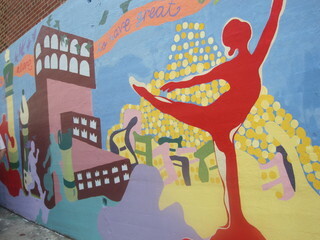 Also in Hamilton Heights is the Dance Theater of Harlem, which offers training and also hosts performances. Shopping: Just outside the neighborhood on Frederick Douglass Boulevard is Hue-Man Bookstore and Café, which hosts several readings. Also on Frederick Douglass Boulevard is the bike shop MODSquad Cycles. To the south of Hamilton Heights on 125th Street is Harlem’s main shopping strip with shops such as H&M, Marshalls and others. Dining: Just south of Hamilton Heights is Pisticci, which serves Italian cuisine. Marcus Samuelsson of “Top Chef” fame recently opened the comfort-food restaurant Red Rooster on nearby Lenox Avenue. And for chicken and waffles and other soul-food dishes, there is Amy Ruth’s on 116th Street.